Rescue workers are searching mud-filled streets and houses on the Portuguese island of Madeira after flash floods left at least 42 people dead. More than 120 others were injured and an unknown number are missing, raising fears that the death toll could rise. 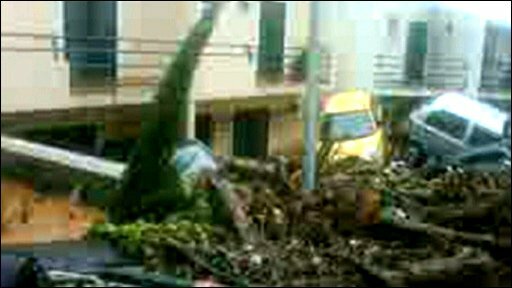 Heavy rains brought tonnes of mud and stones down the slopes of the island, flooding the streets of the regional capital, Funchal, and other towns. Water, power and telecommunications were cut in some areas. 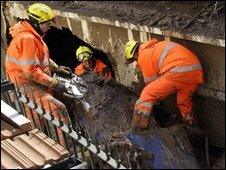 The weather improved on Sunday following Saturday's rains, making it easier for rescue workers. But regional social services spokesman Francisco Ramos said there were "great difficulties" in communications and that the death toll "will likely increase, given the circumstances of this flood". Three remote areas in the south of the island have been cut off. Officials fear more bodies may be found there. The Portuguese cabinet is due to discuss the crisis in an extraordinary meeting on Monday, and expected to announce three days of national mourning. Prime Minister Jose Socrates, who is on the island, said he was "profoundly shocked" by the severity of the floods, and promised that his government would help Madeira recover as quickly as possible. The military has sent specialist rescue and medical teams to the island. Construction companies on the island have lent equipment to clear the streets. The Spanish government has offered its help with the rescue effort. Madeira, located about 900km (560miles) from the Portuguese mainland, is popular with foreign tourists. The Foreign Office in London said a British national had died in the floods, and that a small number of Britons were in hospital on Madeira. The world's most famous Madeiran, Real Madrid football star Cristiano Ronaldo, said he was "shocked and dismayed" by the floods. "Nobody can remain indifferent to the disaster," he said. "I want to express my willingness to, as far as I can, help agencies and authorities to overcome the effects of this devastation." Send your pictures to yourpics@bbc.co.uk or text them to +44 7725 100 100. If you have a large file you can upload here.